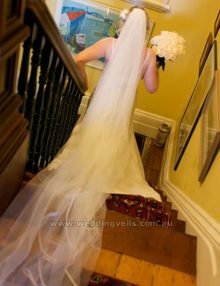 Elegance Chapel is a simply elegant, satin edge veil! 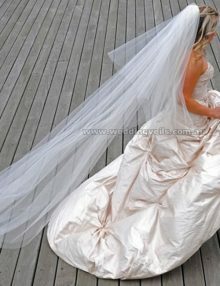 This single tier veil with thin satin edge looks lovely with satin or silk wedding gowns. Can be worn towards the back of the head, or under an up do. Cannot be worn over the face. 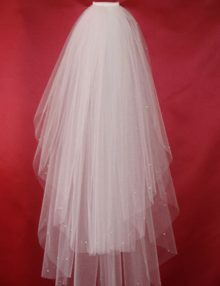 Floor length is suitable for a gown without a train. Chapel or cathedral length is recommended for a gown which has a train at the back. Starting from floor length (180cm), and available in longer lengths. 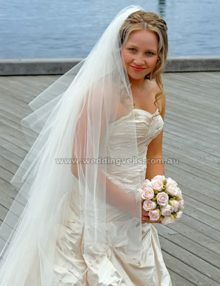 *Worn by our lovely bride Kate from NSW.